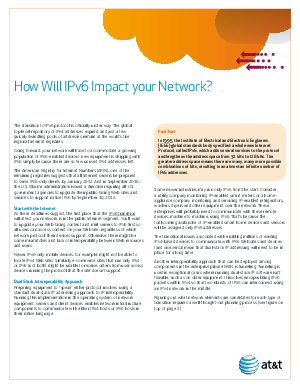 > Research Library > AT&T > How will IPv6 Impact your Network? The transition to IPv6 protocol is officially under way. The global top-level repository of IPv4 addresses expired, and just a few quickly dwindling pools of addresses remain at the world's five regional Internet registries. Going forward, your network will have to accommodate a growing population of IPv6-enabled devices: new equipment is shipping with IPv6 simply because there are so few unused IPv4 addresses left.